This past weekend, RateBeer took over the Sonoma County Fairgrounds for the second edition of RateBeer Best, where over 30 of the top breweries from around the world came together to celebrate craft beer. For someone who has attended a number of beer festivals, RateBeer is truly unique, almost feeling like a reunion for the beer industry rather than a festival. Throughout the weekend, there was a sense of comradery as brewers discussed future collabs, while beer nerds came together not only for the event, but to catch up with friends and share a few brews. The festival that had both brewers and attendees walking out smiling (not just because of the impending brewer’s karaoke) certainly provided something for everyone to be happy about. Here are some of my favorite beers from the weekend. Over the past year and a half, Cory King has continued to wow beer enthusiasts with his Derivation series, which features big imperial stouts (14-15%) that have been aged in a number of different spirit barrels. Having had several beers in the series before, expectations were definitely high, but like so many of Cory’s beers, those lofty expectations were certainly met. While the series mostly features a number of adjuncts, Double Barrel, similar to Blend #3, goes a different route leaving us to focus on the base and the barrel. DB Derivation was aged for two years in 12-year-old Willett bourbon barrels before it was racked onto Port Wine Barrels for three months. Pouring with little to no carbonation, DB Derivation gives off a strong bourbon presence on the nose, with a faint aroma of raisins and port wine. With a thick and oily mouthfeel, the taste follows the nose as the port barrel is the dominating component here, giving off a velvety chocolate and raisin taste that finishes smooth. With these three breweries coming together for a collaboration, I knew this gem would be on the list of must tries. Following the concept of bière de coupage, the three came together in April of 2016 to blend EoC, which uses de Garde’s three-year-old 100% spontaneously fermented beer, Jester King’s two-year-old spontaneously fermented beer, and a foudre aged beer from Sante. The sum of the three created one of the more interesting beers you’ll be able to get your hands on as the beer pours a golden clear color, with a good amount of barnyard funk on the nose. The full mouthfeel provides a bit of cheesy funk on the front end with a faint bite of tartness. From there, the beer quickly mellows out giving off a dry white wine character on the backend of this masterfully blended brew. In 2017, TG brought back Assassin for the first time since 2014. For those attending the festival, there was a collective sigh of relief to see Assassin on the list when the final beer list was released. TG kicked-off the festival with two of their hoppy offerings, leaving attendees circling the booth like sharks for the first two hours of the festival, however once their first beer kicked, the rush to the front began as brewmaster Mike Saboe tapped his masterpiece and checked how it was pouring. The beer pours a jet black with a bit of dark fruit and whiskey barrel character on the nose, with that signature viscous mouthfeel Mike exemplifies with his stouts. The taste is a beautiful interplay of dark fruits, chocolate, and whiskey that lingers on the palate. Now it’s time to start the countdown clock to see what happens with the highly anticipated variants beer lovers are expecting to see in 2017. For those of you familiar with Mead, hopefully you’ve tried something from Superstition, a world renowned meadery out of Prescott, Arizona. If you haven’t tried Superstition, or even worse you’re not familiar with Mead at all, I suggest you fix that ASAP. Since opening in 2012, founders Jeff Herbert and his wife Jen have been dishing out some of the most complex, enjoyable beverages period. While Superstition has a number of offerings, the Berry White series for me is just about as good as it gets. But then there’s FO Grand Cru…a blend that uses 25% of each of the four parts of the Berry White series. That blend was then aged in a barrel that previously held Bottle Logic’s Fundamental Observation for 10 months. Yup, it’s as good as it sounds, pouring a dark red and giving off a mixed berry aroma with a bit of vanilla. With a syrupy mouthfeel, you get an upfront smooth taste of mixed berries with a bit of oak character that finishes with a mélange of tartness and vanilla. Thanks to Superstition’s barrel-sharing program, we all can look forward to more of these offerings in 2017. Back in the summer of 2015, de Garde first released The Broken Truck, a wild ale blend that uses three years of Lambic inspired beers. The name of the beer itself has a personal connection to the brewery, which used to actually own an old truck they used for delivering kegs. One day, on the way to drop kegs off at their distributor, the truck broke down, leaving the kegs sitting in the hot Oregon air. Luckily, a taproom around the corner (Tin Bucket) was able to save the day when they purchased the entire truckload, and thus the beer The Broken Truck was born. For No.2, de Garde blended four years of beer, once again in honor of their friends at the Tin Bucket. The beer pours a golden color with a faint bit of haze, and minimal carbonation that quickly dissipates, leaving a white lacing around the glass. The nose is an incredible blend of lemongrass, funk, and a little bit of tartness. The taste follows suit as you get a tame upfront tartness and crisp lemon zest that slowly transitions to white wine and oak on the backend. To follow up a crazy opening year for Great Notion, the brewery made their first appearance at RateBeer Best, bringing three of their favorites to showcase their offerings, Double Stack (Imperial Stout) Blueberry Muffin (Sour), and Juice Box (DIPA). While all three themselves were stellar beers, the brewery decided to surprise festival attendees with one of their “secrete menu offerings,” Blueberry Pancakes, a blend of 75% Double Stack and 25% Blueberry Muffin. While each beer is excellent on its own, the combination was a game changer with a nose and taste that was spot on for the description. You get the huge maple presence from Double Stack with just the right amount of blueberry tartness on the backend to add another dimension their already award-winning beer. 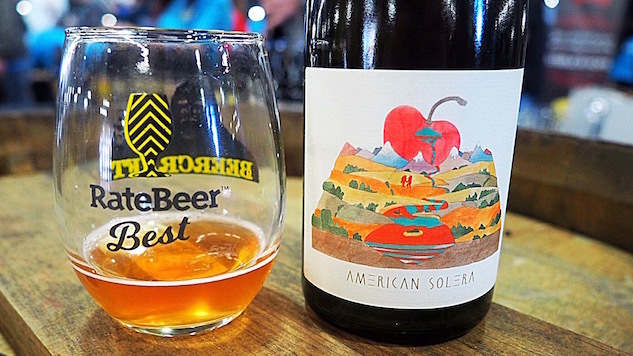 After rumors had been circulating, we saw former Prairie brewmaster Chase Healey open his very own “Side Project,” American Solera in the summer of 2016. Over the past four years that Chase has been at the helm, we’ve seen Prairie grow to become a prominent name in the craft beer scene, however Chase noted it was time for him to step back from the brewery to work on new techniques and ideas without detracting from Prairie progress. It seems that Chase made the right decision after he took home the award for the best new brewery in the U.S. this past weekend. Foeder Cerise is Chase’s sour golden ale with a mix of brett, aged on Montmorency cherries for six months. The beer pours a golden color, with a slightly red / pinkish tint, giving off a tart cherry and apple nose with a little bit of funk. The beer tastes almost like a tart apple and cherry pie, as you get the upfront tartness that isn’t overwhelming followed by vanilla, cinnamon, and a little bit of oak on the finish. A top 10 list would not be complete without at least one beer from Shaun Hill. Once again, Shaun walked away from this weekend’s festivities with the award for the top brewery in the world. While Shaun brought a few gems, including a not-yet released Madness and Civilization (No. 8), it was his GoM variant that caught everyone’s eye. Akmel Nuri is Shaun’s latest variant of GoM, his wheat imperial stout aged in bourbon barrels for over 20 months. Akmel Nuri uses coffee coming from Copenhagen’s Coffee Collective which buys its coffee directly from Akmel’s farm in Ethiopia. The beer pours jet black with a creamy toffee colored head that slowly dissipates with notes of roasted coffee and bourbon. With a rich mouthfeel, this brew is a bit more restrained on the coffee which comes off a little creamier than the Kieni variant, and finishes with the perfect amount of barrel character to round out the backend. Over the summer of 2016, Prairie first introduced locals to a draft-only version of Paradise, an imperial stout coconut and vanilla. Then in the fall they caught everyone’s attention when they released Pirate Paradise, that very same stout aged in rum barrels. The beer pours jet black with minimal head, giving off notes of a coconut covered browned on the nose, with faint rum barrel character. The taste is a treat as you’re able to get each component of the beer: chocolate, coconut, and a little bit of a vanilla undertone, finishing with the rum barrel character. Since opening in 2012, the beer scene has seen Monkish remake itself over the years. While they originally focused on Belgium style offerings, the brewery began to dip their toes in the hoppy game this past year, riding out the craze for hazy IPAs. While they still continue to pump out solid mixed fermentation brews, it’s their new hoppy offerings that catapulted them onto our list for Best Breweries of 2016. It was this Triple IPA brewed with El Dorado and Galaxy that stood among their many offerings as they continue to deliver with their big hoppy beers. The beer pours a hazy orange color with aromas of tropical fruit and a bit of pine. The mouthfeel is frothy and bold as the taste delivers with a bit of pineapple, orange, mango, and a good amount of pine-bitterness on the back to balance it out. One last bonus beer to my top 10 list, as my favorite from the weekend was a bit of a surprise as bottles showed up around the festival. After releasing this renowned brew along with another beer on our list just a few weeks ago, I was crossing my fingers for this to be in attendance at RateBeer. It’s been three years since TG last released KBBS, a beer that has become the most sought out imperial stout in craft beer today. To be honest, I haven’t actually even seen a bottle in-person in about four years. While the label received a small makeover for this year’s batch, TG brought back the silver wax we saw on the first bottling back in 2013. The beer pours jet black with a minimal amber head that quickly dissipates, leaving a creamy coating around the edge of the glass. The nose is straight maple syrup, especially as the beer warms, with a little bit of coffee poking its way through. The chewy mouthfeel starts off with a wonderful maple flavor that transitions to a faint roasted coffee taste that provides a little bitterness to cut the maple sweetness on the backend. Hopefully we don’t have to wait too long to see this brew released again!